Malegaon: Swami Aseemanand, key accused arrested in Ajmer and other blasts, in a sensational statement in front of has confessed the role he and other Hindutva terrorists played in 2006 Malegaon blast and Samjhauta Express blasts. According to the latest issue of Tehelka - the fortnightly English magazine, Swami Aseemannad has given his confessional statement in front of a Magistrate in New Delhi and admitted RSS Pracharaks' role in executing blasts at various places including 2006 Malegaon blast and the blast in Samjhauta Express. "It was not Muslim boys but a team of RSS pracharaks who exploded bombs in Malegaon in 2006 and 2008, on the Samjhauta Express in 2007, in Ajmer Sharif in 2007 and Mecca Masjid in 2007", Asish Khetan of Tehleka has quoted Swami Aseemannad as telling in his confessional statement. Tehelka claims that the 42-page confessional statement of the Swami is in its possession. 32 people had been killed and more than 300 people had been injured when a series of blasts struck Malegaon on September 08 in 2006 ahead of Shab-e-Barat, a Muslim festival when thousands of people were busy in offering Friday prayers in a mosque. As was the customary for the investigating agencies during those days, the blast was immediately blamed on Muslim youth. Later on, police arrested the Muslim youth one by one who are still in jail. Ironically one of the accused who is in jail and has been chargesheeted as one of the planters, was some 600 kms away from Malegaon when the blast occurred on September 8, 2006. Moreover, Abrar Ahmed, one of the accused, who later became approver but turned hostile, in an affidavit filled in the court claimed that the arrested Muslim youth are innocent and were framed in the blast case. Swami Aseemanand's confessional statement, the copy of which Tehelka claims to be having in its possession, is another blow to the prosecution. In a curious twist, however, in one of those inexplicable human experiences that no one can account for, according to Aseemanand, it was an encounter with one of these jailed Muslim boys that triggered a momentous emotional transformation in him, forcing him to confront his conscience and make amends. 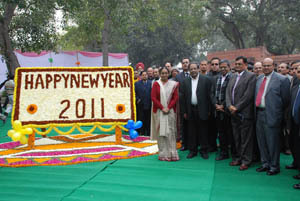 Speaker Lok Sabh Mrs. Meira Kumar with the staff of the Lok Sabha Secretariat at the New Year Celebrations at Parliament House, in New Delhi on January 05, 2011.